Sometimes a catastrophic event alters mobility in the blink of an eye. But, all too often, the slow erosion of dexterity is a creeping, subtle culprit. One day, the normal twisting, turning, or climbing required to get into and out of a vehicle becomes a challenge. 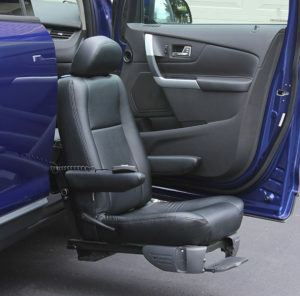 Valet / Turney Seating can help remove the challenge of getting into and out of your vehicle. These independent living aides not only removes the challenge it does it in style! You’ve always been a person of action. Hopping in your car and going at a moment’s notice. You can stay that way. Valet / Turney seats are designed for practically every type of vehicle. Love those high riding SUVs? Pickup trucks more to your liking? It doesn’t matter. Kohll’s can match your lifestyle and your vehicle with a turning seat that will deliver independence.